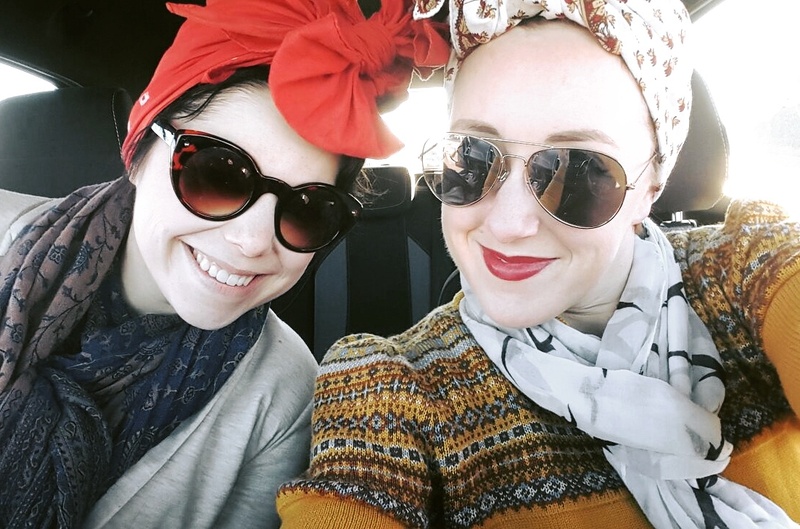 We often get questions about vintage headscarves - How to tie them? Where to get them? How large should they be? How to wear them? Abby and I wear scarves-upon-our-heads so often that they've become a part of our regular vintage-inspired wardrobes. How nice is it to just cover up that bad hair day? Or maybe you've set your hair in pin curls but need to go about your daily business....in public...with a suitably fabulous head covering. Or maybe you just want to look cute. 1. Start with a large scarf about 1 yard square (36 x 36" wide). You don't want much smaller than this, but larger is OK. Note: nearly all handkerchiefs you can buy in the store are too small. If you want full coverage and that nice big vintage bow, check out Burnley & Trowbridge (which is what we wear), or make your own scarves from lightweight printed cotton. 2. Fold the square in half corner-to-corner to make a triangle. The long edge of the triangle is stretchy because it's on the bias when folded this way, which allows for a good tight bow and helps the scarf stay put. 3. Place the middle of the long folded edge of the triangle at the nape of your neck, then pull the long tails up in front of your fore head. At this point, your bow style is up to you. You can knot the tails, catching in the short triangle between the two knots, tuck the tails in various ways, or tie a bow over the short triangle. It's personal choice and experimentation. 4. Just behind the bow/knot, on either side of your head, tuck the scarf down. This is sortof a folding/rolling motion that tucks the loose parts down against your head and gives a trim appearance. 5. Pin the sides above your ears with bobby pins. Pin the center back if you like. And fluff the bow! Many of you have asked how I tie my head scarves, so here's a simple demonstration. My scarves are reproduction 18th c. neckerchiefs made by Burnley & Trowbridge and are quite a bit bigger than your average handkerchief. The technique is the same, I just tie an extra bow on top with the long tails. Use cotton. Avoid silk, which can be too slick. Pin curl your hair around where the scarf edge will sit. These aren't nice pin-curls - they're just there to anchor the scarf. This is especially a good idea if you have fine hair and also long hair. Tie your scarf tight enough - the bias created by the triangular fold is stretchy, which means it can get loose throughout the day. Be sure to tie the scarf on tight enough and re-tie as necessary. Bobby pin the scarf above your ears and at the center back. Tying and wearing head scarves takes practice. Don't get discouraged - find what works for you. Start with a low-profile knot and build up to a bigger bow as you feel more comfortable. Deco Darlings - Pre-Order is OPEN! The Deco Darlings Shoes - Previews!